Tornado warnings were in effect all over the map on Tuesday, with areas from the Midwest to the Northeast being advised to take precautions during what was another day of wild and severe weather. There were no significant tornado threats overnight, but parts of the country may be in danger of seeing twisters Wednesday afternoon, Weather Channel meteorologist Carl Parker said. However it is unlikely that any potential tornadoes formed in the next 24 hours would be anywhere near the size of the one that ravaged Oklahoma on Monday, according to Parker. Ohio and areas near the Great Lakes are most at risk of damaging wind gusts, large hail and tornadoes on Wednesday, according to The Weather Channel. 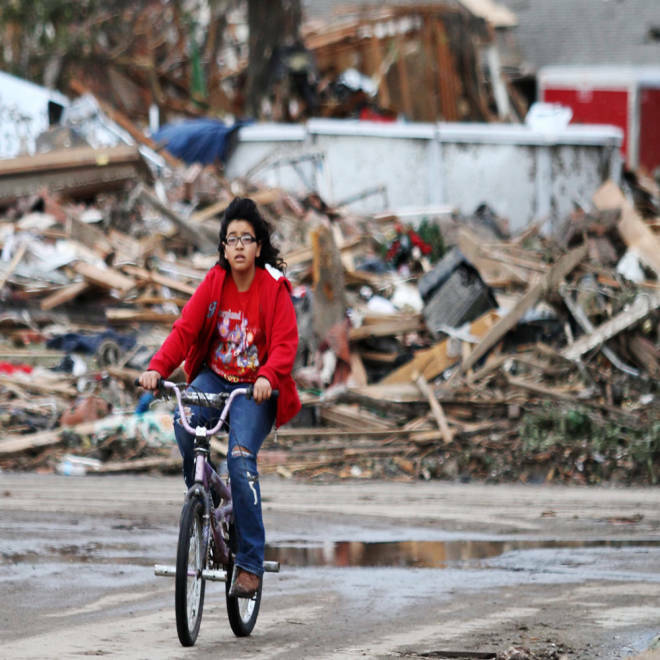 It is better news than Tuesday, when 9.5 million people were in danger of experiencing "large and devastating" tornadoes as the deadly storm system moved east, forecasters warned. And it was not just contained to Tornado Alley. Areas of western Massachusetts and Connecticut as well as eastern New York State also were issued tornado warnings Tuesday evening. While many of these places have been experiencing strong winds and rain, none reported any twisters. Tornado watches were in effect for portions of Arkansas, Mississippi, Louisiana, Missouri and Tennessee until 11 p.m. ET. Eastern Texas, central Louisiana and Mississippi were issued a severe thunderstorm warning going into Wednesday morning. Severe rain and flooding caused havoc throughout the Dallas-Fort Worth area Tuesday afternoon. Area schools let out early and even the Dallas zoo closed to protect animals and visitors. Weather Channel forecaster Bill Karins said the upcoming holiday weekend may provide some relief. "An early look at Memorial Day weekend shows that most of the country should be quiet. The stormiest weather appears to be across the Plains and Midwest with scattered showers and thunderstorms," he said.